Ok so this is like the greatest show ever...ever. 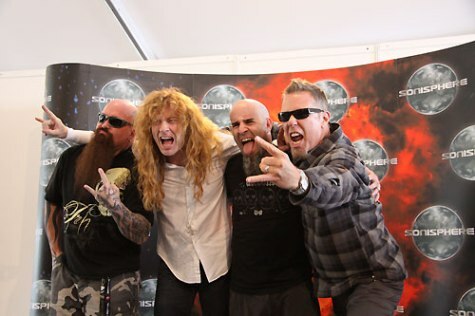 Metallica, Megadeth, Slayer, and Anthrax (crappy without Bush, but ok)...they are known as the Big Four the founders of thrash metal. And they are doing some shows together for the first time...in Europe. Thanks guys, you founded thrash in America and put America on the map for heavy metal, but let's go there first. 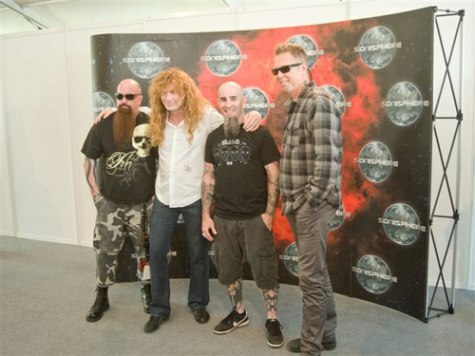 Whatever...to see them together is awesome. 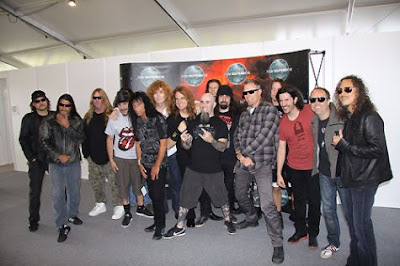 I saw this picture this morning and was blown away...it's so surreal to see these guys together. 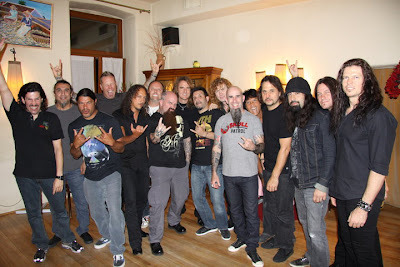 All the drama with Mustaine and Metallica or Mustaine and Kerry King Or King with Metallica...to see them in a room wow. There were even more pictures taken later. The one with the four "leaders" of the bands is awkward to see James off to the side almost...but I think it was the timing of the photo. James seems to be above most of the drama nowadays. I don't go to concerts, but I am strongly considering going if this thing comes to the U.S. It's amazing. I guess it would be like getting The Beatles, Elvis, and The Beach Boys (I'm reaching here people) together for one show. It's huge take my word for it. This thing will come to dvd one day and I will buy it, but being there would be so much better.